Steel fencing posts can also have a variety of other names associated to them depending on their design and country. Some are known as Y-posts, T-posts and star posts. The posts themselves can be made up of regular steel or can also be made up of the durable rail steel. 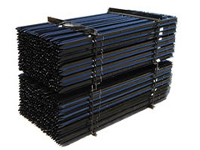 These posts can be used to support all types of mesh and wire fencing. Steel fencing posts are driven into the ground with a post pounder and very strong and can be made into a steel fence posts that can help keep out all unwanted animals or keep wanted animals in. In Britain more often than not wooden posts are used or concrete ones but where solid rock needs to be drilled into steel fencing posts are erected and used to build a fence. These great objects are very handy for agriculture and keeping lice stock. Below we go into some detail on how to install steel fence posts and some handy tips to help out new comers who want to install steel fencing posts. First off and the most obvious is you need to dig a hole for the post to go into. Make sure that at least a 3rd of steel fencing post is below the ground to give you that solid foundation to building a fence. To stop the steel fence post from rusting a good idea is to apply rust inhibiter onto the section of steel fence post that will be placed into the ground. Now comes the part where we need to put the steel fence post into the hole making sure that it will be level to any other posts that have been erected or that it is in fact the corner post (depending on design). Next is to fill up the hole with either soil or a mixture depending again on the type of fence being installed and compact down the soil with a sledgehammer to make sure the post is solidly in the ground. Next we need to mix up some concrete and place that around the steel fence post to sure up its foundation and to keep it in place. A good idea is to use a level on each side of the steel fence post to ensure it stays direct straight up and provides the best possibly fence. Lastly all that is needed is to brace up the fence with supports or if you’re really bored you could hold it in place until the cement hardens but my opinion would be to place supports all around the steel fence post. A good idea is to check on the steel fence post every so often to make sure as the cement sets it is staying in the desired position and the supports or the steel fence post itself haven’t moved as the concrete has set. This ensures a straight post and not will only look more professional but make sure that the post is as solid as it can be.